Once again, a warning about Fake Fabergé, "Fauxbergé' so called by Fabergé expert Géza von Habsburg. Although all Imperial Easter Eggs are accounted for, even the missing Eggs, from time to time I get inquiries about "a never before seen Fabergé Imperial Egg". Forget it folks, unless you have found one of the missing Eggs, there are no Imperial Eggs to be found and if one IS found you will read it all over the internet in news sites and it will come up at an auction and realize many, many millions in Euros, Dollars or Pounds! Due to copyright issues I was forced to remove an image of FAKE Fabergé Eggs as well as an image of a FAKE mark on one of those fake eggs I found online and was granted permission to use on this page. As we say in Dutch, "it should not get any more crazy". But please, do Google "Fabergé Fake or Fabergé Faux" to get an idea of what the images looked like. Of course there is "modern Fabergé" or "in the style of", or even "inspired by" too and as long as you know what you buy, that is ok, but when fake is sold as real, that is very, very wrong! Read here about "in the style of", modern, or replica's! So please, anyone who gets offered "a truly remarkable Fabergé Egg, hidden in a vault for many, many years", do not fall for it! The real stuff will go through a major auction house and you will read about the millions of dollars involved in the newspapers! Please note that some of the fake stuff online seems to bear workmaster marks by real Fabergé workmasters. Of course these marks are fakes too! Please do read what Peter Schaffer (ALVR) says about marks lower on this page! 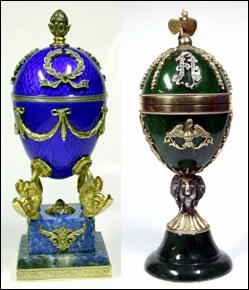 A good website, where you can compare the real versus the faux, is kfabergé.com from Steve Kirsch, below two "Imperial" Eggs from his website. Do read Steve's article on how How can you tell the real thing from the fakes? As Steve concludes his article: Basically, collecting Fabergé requires money. Real "bargains" are virtually nonexistent. You are much better off saving for a single piece that may be expensive, but original, than trying to get something cheaply. It's far worse to purchase a piece that is a fake than to possibly overpay for something that is "right". What does a fake sell for? In the above YouTube movie of a 20th century Fake Fabergé Egg being examined by appraiser Sebastian Clarke on the Antique Roads Show, you can see that a lady paid $15,000 for the egg!! 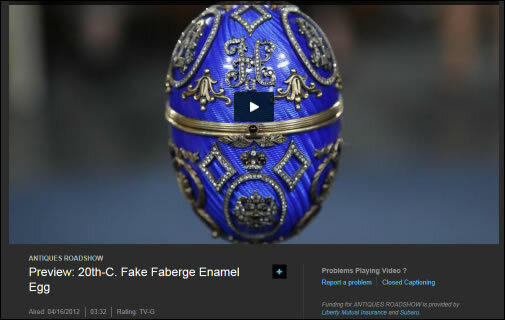 - Tips of the Trade - Peter Schaffer of ALVR on detecting Fabergé Fakes. Make sure you read the part about marks: "... collectors look to a piece's marks for verification. Bad idea, says Schaffer. Marks are now made with lasers that can trace a real Fabergé mark onto a fake piece. "You just can't trust them," he asserts."